According to new reports, the US government has built a system that can record every phone call made over a month in an undisclosed foreign country. The National Security Agency (NSA) program was created in 2009, the Washington Post reported. Fugitive Edward Snowden, who leaked details of the system, promised more revelations. Civil liberties groups called the report “chilling”, but US officials would not comment. 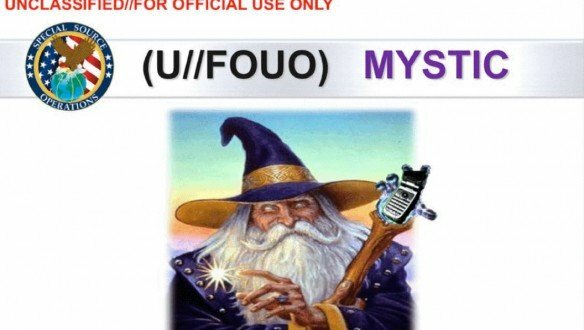 An NSA cover slide used for an internal briefing on the system, known as Mystic, shows a cartoon wizard wielding a staff with a mobile phone at the top. Mystic is the only known US surveillance program to capture every single call across a nation’s telephone network, according to the Washington Post. The newspaper said that, at the request of US authorities, it would not name the foreign country, or others where the system’s use was envisaged. It reported that a classified summary of the system suggested billions of conversations were being captured in a 30-day rolling buffer that clears out the oldest calls as new ones are made. But civil liberties activists said it was “a truly chilling revelation”. “It’s one that underscores how high the stakes are in the debate we’re now having about bulk surveillance,” Jameel Jaffer, of the American Civil Liberties Union, told Reuters news agency. Meanwhile, Edward Snowden appeared on Tuesday in the form of a remotely controlled robot at the influential TED conference in Vancouver, Canada. “There are absolutely more revelations to come,” said Edward Snowden, who fled to Russia last year.